This year, the Serpentine Galleries in London celebrate the 15th anniversary of the Pavilion commission. Starting with Zaha Hadid as the architect of the first Serpentine Pavilion in 2000, many world-famous architects have created temporary structures in London’s Hyde Park, including Herzog & de Meuron and Ai Weiwei, 2012; Frank Gehry, 2008; Rem Koolhaas and Cecil Balmond, with Arup, 2006; Oscar Niemeyer, 2003; Daniel Libeskind with Arup, 2001; and Smiljan Radić, 2014. In 2015, Spanish architects selgascano (José Selgas and Lucía Cano) designed the 15th Serpentine Pavilion. The Pavilion is an amorphous, double-skinned, polygonal structure consisting of panels of a translucent, multi-colored fluorine-based polymer (ETFE) woven through and wrapped like webbing. The architects’ inspiration comes from the site itself, as well as from the ways in which people move through London, notably the Underground with its many-layered, chaotic yet structured flow. José Selgas and Lucía Cano formed the studio selgascano in 1998 in Madrid. They have completed the majority of their buildings in Spain through a diverse range of commissions. Selgascano is currently working on a number of projects worldwide, including Pip House, Laurel Canyon, Los Angeles; the renovation of Texas Square in Oranjestad, Aruba, Lesser Antilles; and La Canaria House, Mount Washington, Los Angeles. Selagscano exhibited at the Guggenheim Museum and the Museum of Modern Art, New York, as well as MOT, Tokyo; the Design Museum, London; and the Venice Architecture Biennale in 2010, curated by Japanese architect Kazuyo Sejima of SANAA, architects of the Serpentine’s 2009 Pavilion. 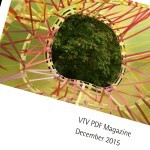 Serpentine Pavilion 2015 Designed by Selgascano, Hyde Park, London (UK), October 16, 2015. The Serpentine Pavilion has become an international site for architectural experimentation, presenting inspirational temporary structures by some of the world’s greatest architects. A much-anticipated landmark in London each summer, the Pavilion is one of the top-ten most visited architectural and design exhibitions in the world. In 2015, Spanish architects selgascano designed the 15th Serpentine Pavilion. The award-winning studio, headed by José Selgas and Lucía Cano, was the first Spanish architecture practice to be asked to design the temporary Pavilion on the Serpentine’s lawn in London’s Kensington Gardens. In keeping with the criteria of the scheme, this was the studio’s first new structure in the UK. The Pavilion was an amorphous, double-skinned, polygonal structure consisting of panels of a translucent, multi-coloured fluorine-based polymer (ETFE) woven through and wrapped like webbing. Visitors could enter and exit the Pavilion at a number of different points, passing through a ‘secret corridor’ between the outer and inner layer of the structure and into the Pavilion’s brilliant, stained glass-effect interior. The architects’ inspiration not only came from the site itself, but from the ways in which people move through London, notably the Underground with its many-layered, chaotic yet structured flow. selgascano’s design follows Smiljan Radić’s Pavilion in 2014, which was likened by many to a spaceship resting on Neolithic stones. Previous architects include Sou Fujimoto, 2013; Herzog & de Meuron and Ai Weiwei, 2012; Frank Gehry, 2008; Rem Koolhaas and Cecil Balmond, with Arup, 2006; Oscar Niemeyer, 2003; Daniel Libeskind with Arup, 2001; and Zaha Hadid, who designed the inaugural Pavilion in 2000. As with previous Pavilion commissions, the brief was to design a flexible, multi-purpose social space with a café that is open to all throughout the summer. Previous selgascano projects include the amorphous Plasencia Auditorium and Congress Centre, Cáceres; the light filled harbour-side structure of El ‘B’, Cartagena Auditorium and Congress Centre; the playful floating shapes of Mérida Factory Youth Movement. selgascano’s work is characterised by a use of synthetic materials and new technologies, often rarely applied to architecture. Taking inspiration from Luis Barragan and Richard Rogers, the architects use distinctive colours and references to nature throughout their designs. Their belief that architecture is secondary to nature also informs the design course on Nature and Climatology that they teach at the Massachusetts Institute of Technology and their work on the Educational and Medical Pavilion in Turkana, Kenya. Exhibiting at the Guggenheim Museum and the Museum of Modern Art, New York, as well as MOT, Tokyo, and the Design Museum, London, selgascano was chosen for the Venice Architecture Biennale in 2010, curated by Japanese architect Kazuyo Sejima of SANAA, architects of the Serpentine’s 2009 Pavilion. selgascano has designed the interior of Second Home, a revolutionary new workspace for London’s creative industries in the heart of London’s technology quarter in Shoreditch.